It was brilliant to work with Lou Hannah, the amazing anchor from France24 reporting live from outside Buckingham Palace on the day of the wedding and to meet Mary Kathryn Burke from ABC America who was thrilled to hear all about Robinson Pelham. Elizabeth Emanuel, the designer who created Princess Diana’s wedding dress in 1981 was absolutely charming. 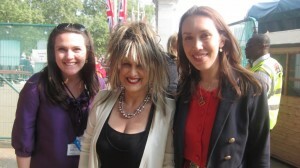 We also got to talk about jewellery with royal correspondent Jennie Bond.